This month will be a little light on on information, as for the first time for many, many months we have slowed down a little and actually had time to draw breath. That has made a nice change, because although we are on a working holiday, life has been a bit hectic. There is so much to see and do that you really have to stay on your toes and keep moving to fit it all in. So the beginning of the month saw the Priestleys move on for the homebound segment of their trip away. They decided on heading south to Port Augusta, across to Broken Hill and back up to Bundaberg. Surprisingly it was actually shorter to go that way than it was to go back north to the Three Ways and across to Bundy. Go figure. They had a week at the Rock and had a great time, exploring and with time to rest and chill out. That's the way a holiday should be, not like many others trying to see 7 cities in 7 days. Tha'ts madness. The more I speak to the traveling public, the more I think 1/2 of them are off their rockers. The amount that some people try to fit in a short time frame defies logic. Surely common sense would dictate that if you have a month off you would concentrate on one small area and see it well, as opposed to driving through 4 states at break neck speed, seeing nothing but the inside of the car and proudly telling all that they traveled 25,000 kms. They must need a month to get over it!!!! On Priestleys last night we shifted into our temporary house and then went out to dinner. The reason the house was only temporary was that we were waiting for our newly renovated one to be finished. It was well worth the short wait with us shifting in on the Thursday night. As we knew we would be moving in a few days we unpacked almost nothing so the shift was pretty easy and all over in a matter of hours. 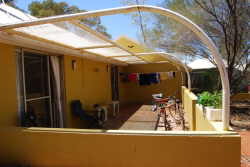 All the staff accommodation at Ayers Rock Resort is owned by Voyages with the Health Dept leasing the houses. The one we have is a modern spacious two bedroom unit, well furnished with a semi-covered area back and front. It has fully ducted air-conditioning, ceiling fans and all new appliances. The back of our house looks over a large area about the size of a football field that about 20 other units also look into. There are other kids in the area which is an added bonus. While by no means the biggest home we have had so far, it certainly is very homely and very nice to live in. 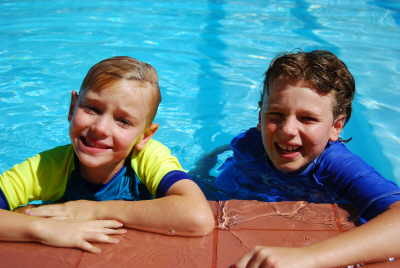 The boys started going to school on the first day of Term 4, for about 3 days a week each, with the other days spent doing their home schooling. The going to school thing is really just for the social aspect. It is a very good school with 4 teachers and about 60 kids enrolled from P-12. The kids in high school do Distance Education with a full time teacher there to help them when needed. The kids are really enjoying the school and have met lots of nice kids. 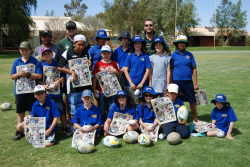 They recently had some NRL players come out to run a training session with the students. Alex was in his element! Living in the Resort is an interesting mix. It very much has a 'holiday' feel about it (obviously) while also having a strong 'community' feel. It is a social little place and I imagine the longer you stayed, the more social it would become. You also have the added advantage of 4 large resort pools, as well as numerous smaller ones scattered throughout the residential areas, a pile of restaurants, bars, tennis courts and of course the 'Res Club'. There are also plenty of sports for kids and adults alike. Alex has just started playing Touch which he is enjoying, and the boys are having weekly swimming lessons also at the Res pool. To be quite honest you really want for nothing stuck out here in the middle of the desert. Work has been good, be it a little quiet with enough overtime to significantly boost the pay packet without interfering with the lifestyle. The clinic only attends to resort staff and the tourists. (There is another clinic at the local Aboriginal community.) There are only 2 other staff who are very easy to get along with. We have 2 ambulances that we take home when we are on call. Generally you never get called after 10-00pm. Now that is civilized and with most call outs you are back in 1/2 hour. On top of my usual work at the clinic I have also fallen into a few other roles. Each fortnight the resort (Voyages) runs an induction day for all the new staff. There is usually between 45-60 new staff starting (the staff turnover at Voyages is huge). As part of the induction I do a presentation explaining the role of the clinic and how it can be accessed. That is a bit of fun and fills in a bit of time each fortnight. 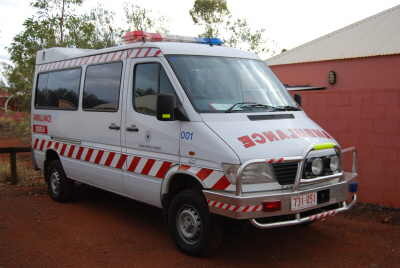 I have also taken over the role of keeping the "Ambulance Auxiliary" trained and enthusiastic. We meet for a few hours once a week and it is interesting and at times a little challenging. We rely heavily on the auxiliary to assist us, especially after hours. 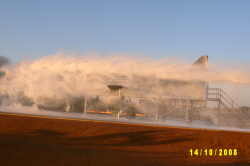 We recently did a training session with the 'Fire-ies' at the airport simulating a plane crash. 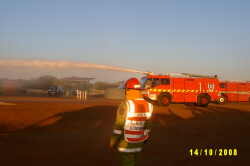 Those airport fire trucks with the water canons on the roof are amazing. They can pump out 60 litres of foam every second and would kill a person if hit by the blast. It would be a bugger to survive the plane crash, to be then killed by the foam!!! So what else is there to share with you. 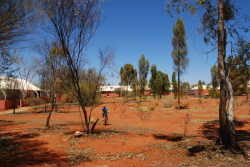 Chris has been out to the local Aboriginal community, Mutitjulu which is at the base of the Rock. She has picked up a bit of 'Tutoring', on whatever day she chooses at $46.00 an hour for a maximum of 20 hours a week. She will only do 2 days a week. That will well and truly pay for our food and going out expenses, which are really the only expenses we have at present. Of course it will also be yet another great experience and will give us a foot in the door to both the social and cultural aspect of life at the Rock. At the time of writing this Chris has now worked out there for a few weeks, and at first wondered what an earth she was thinking, but as time goes by and she gets to know the kids better, she's actually starting to like it! So if you combine everything above with the fact we have mobile phone service, both Next G and digital, and therefore wireless internet access, you have a very enjoyable existence. At this stage, which is only week 7, we have extended our contract until early December and would very much consider a long placement here early next year. We will see what happens but at this stage it looks like we will come back here in early February. Chris recently flew to Brisbane for a long weekend. The trip had a two fold purpose. Firstly our niece, Kirsty got married to Dean. Kirsty is my youngest brother, Shane's eldest daughter (you got that!!). Our other two nieces, Jess and Sam (Kirsty's younger sisters) were two of her bridesmaids. The wedding and reception were held at Hope Island Resort and all went really well, with Chris enjoying the chance to catch up with family. I am told the bride looked beautiful (as would be expected) with Chris taking the standard 200 photos. Then the next night was Chris's 30 Year High School Reunion (clearly she is much older than me). She had a fantastic night catching up with people last seen so long ago, and in many cases felt like she'd only seen them yesterday. Lots of stories, reminiscing and laughter and another 200 hundred photos to sort through! Unfortunately she missed her 20 year reunion as we were in Sydney having just returned from Bali, so it was good for her to get to this one. The boys and I battled on at home eating out regularly at the 'Res'. It was a shame we were all unable to get to Brissie but being a bit short staffed at work made it difficult (who said I had no work ethics), not to mention the expense. Besides, let's face it, weddings are a bit of a girly thing. 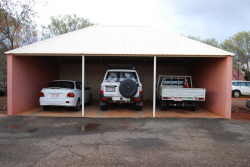 We have also had a long weekend in Alice Springs at the end of the month, which was a nice break. Unfortunately it is a 900km return trip which takes about 4-1/2 hours each way on what I must say is a rather boring road. While in town we had some air bags installed in the car and also had it serviced ready for the trip home in December. Then we shopped, shopped and shopped and ended up buying some more aboriginal paintings while walking down the Mall. The local Art Galleries complain to the Council about the locals selling their paintings in the Mall. Then of course the Council forbids the locals from selling without a permit. The reason of course is that the galleries are horrendously expensive, after giving the locals pittance for their art. We bought some beautiful pieces for around $50 to $70 each. If you are in Alice, go to the Mall on the weekends around 2-00pm after the galleries close and grab a bargain or two. Everyone wins (except for the Galleries) and you will end up with a memory of Central Australia, without having to sell your house to pay for it. 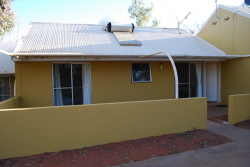 We stayed in a lovely Motel in Alice that we got for the bargain price of $98.00 a night for a family room (usually $185.00) simply because we told them we worked at Yulara. Not only was it cheap but also very flash and absolutely in the middle of town with plenty of eating choices available nearby. No need to drive anywhere. If you are ever looking for a great motel, don't go past the 'Diplomat'. Well that's it for October. The year is rapidly drawing to a close, the weather is warming up and the shops are full of Christmas decorations. We hope you are all well as we are. Until next time. ‘Living life’ is like a stepping stone. It's our choice to either use those stepping stones to cross the creek, or to stay on the side were on, never knowing what adventure lies ahead or what we are missing out on.